A number of events led to the decision of an extremist terrorist group of the Lebanese kata’ib forces and forces belonging to the Zionist Army to carry out massacres against the Palestinians. From the beginning of the Zionist invasion of Lebanon, the Zionists and their agents were working toward being able to extirpate the Palestinian presence in Lebanon. This may be seen from a number of massacres of which the world heard only little, carried out by Israeli forces and militias under their command in the Palestinian camps in south Lebanon (al-Rushaidiya, ‘Ayn al-Hilu, al-Miya Miya, and others). This massacre was thus the outcome of a long mathematical calculation. It was carried out by groups ofLebanese forces under the leadership of Ilyas Haqiba, head of the kata’ib intelligence apparatus and with the approval of the Zionist Minister of Defense, Ariel Sharon and the Commander of the Northern District, General Amir Dawri. High-level Israeli officers had been planning for some time to enable the Lebanese forces to go into the Palestinian camps once West Beirut had been surrounded. Two days before the massacre began – on the evening of September 14 – planning and coordination meetings were held between terrorist Sharon and his companion, Eitan. Plans were laid to have the kata’ib forces storm the camps, and at dawn, September 15, Israel stormed West Beirut and cordoned off the camps. A high-level meeting was held on Thursday morning, September 16, 1982 in which Israel was represented by General Amir Dawri, Supreme Commander of the Northern Forces. The process of storming the camps began before sunset on Thursday, September 16,and continued for approximately 36 hours. The Israeli Army surrounded the camps, providing the murderers with all the support, aid and facilities necessary for them to carry out their appalling crime. They supplied them with bulldozers and with the necessary pictures and maps. In addition, they set off incandescent bombs in the air in order to turn night into day so that none of the Palestinians would be able to escape death’s grip. And those who did flee – women, children and the elderly – were brought back inside the camps by Israeli soldiers to face their destiny. At noon on Friday, the second day of the terrorist massacre, and with the approval of the Israeli Army, the kata’ib forces began receiving more ammunition, while the forces which had been in the camps were replaced by other, “fresh” forces. On the 30th anniversary of the Sabra and Shatila Massacre, Dr. Ahmed Bahar, the senior Deputy Chairman of the Palestinian Legislative Council, called for providing decent life and to improve the living conditions of Palestinians in the diaspora, especially in the refugee camps in Lebanon in light of their worsening living conditions. Dr. Bahr called on, in a press statement on Sunday, the human rights and humanitarian organizations to expose the Israeli crimes against the Palestinian people and to prosecute them. He also stressed the Palestinians' right of return to their towns and villages from which they were displaced, calling for not to compromising the right of return that is considered one of the national constants and the essence of the Palestinian cause. He also praised the steadfastness of the Palestinian people in addressing the occupier that committed several massacres against the Palestinian people such as Sabra and Shatila massacre in which more than 6 thousand Palestinian refugees were killed. Dr. Bahr called on the Palestinian people to continue their resistance and steadfastness till the liberation of all the Palestinian lands. He called on the Lebanese government to provide assistance to the Palestinian refugees and to provide them with protection and their human rights such as education, reconstruction and freedom of movement, confirming his rejection of proposals to settle the Palestinians in Lebanon or any other country but Palestine. He pointed out that war crimes are not subject to statute of limitations, stressing the Palestinian people's right to prosecute the Israeli officials who committed the massacres of Sabra and Shatila in the International Criminal Court. 28 years ago, one September day, after playing with my siblings and friends in our land, we returned home with joy in our hearts. We were very happy and rushed to tell my parents of our plan to go on a “picnic” the following day with our friends. My father looked at us and said calmly: no, there will be no picnic tomorrow. My parents were sitting in front of the TV, both unusually quiet, my father’s eyes looked troubled, my mother had tears in her eyes. The house was silent, dead silent, except for the screams coming from the TV. I looked at the TV and saw the same images over and over: dead bodies …. dead bodies …. dead bodies…. 28 years ago, I saw images of butchered Palestinians, piled up like sacks one over the other. I saw images of murdered men, women, children and elderly filling the streets. I saw women crying and shouting and cursing. I saw Sabra and Shatila. 28 years later, I remember Sabra and Shatila, look at the images of the martyred victims. I memorize the 3500 names of those tortured to death, of those butchered. I read out loud the testimonies of those who survived the atrocities. I think of their pain, their suffering and of their fear. I think: 62 years of murder, 62 years of terror, 62 years of Zionism occupying Palestine and threatening humanity. 28 years ago, I understood for the first time what it means to mourn, what it feels like to lose someone, how much it hurts to see someone lying in their blood, hear the stories of the their last minutes, listen to the screams of those who survived. We sat in our living room in occupied Palestine and saw the images of all those men, women and children, lying dead in the streets. It was like waking up from a dream, and realizing that for you, as a Palestinian, there was no place for picnics, no place for happiness as long as other Palestinians were being murdered, that there is no place for happiness as long as Palestine is still occupied. These Palestinians did not live in Palestine, they were far away from us, but they were part of us. They were far away, in places called Sabra and Shatila. It was the first time that I hear of these places and since then these two names never left me. They were far away from their homeland, far away from Palestine, and we in Palestine, mourned them, cried for them and felt the pain of those who survived. They were the brothers far away from home, the sisters we never met, the cousins we heard of, the family that is an extension of every family in Palestine. They were the branches that were forcibly cut off of the olive tree. They were the roots that were snatched away from our mother Palestine. 28 years later, I remember Sabra and Shatila. I remember that Palestinians are targeted everywhere. I think of those among us steadfast in our land refusing to leave despite the daily Zionist terror, and think of those in the Diaspora dreaming and waiting for the return. We are the parts that make Palestine full; we are one body and when one part of Palestine bleeds, all of Palestine bleeds. 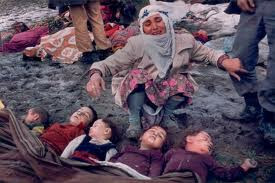 I remember every massacre and every crime committed against the Palestinians. And despite the hopes, the wishes and aims of the Zionists, every massacre, every drop of Palestinian blood, every cry of a Palestinian child makes us stronger, more steadfast, more resolute to fight the occupation and the oppression. With every massacre and with every crime we grew closer and stood as one; one body aching for freedom. With every massacre and with every crime we cry for every victim of oppression, we go to the streets for every martyr and every wounded and every prisoner, we protest every injustice and demand our legitimate rights. It is our unity that makes us strong, a blood bond that not the Zionist entity, not the US, not even the treacherous Palestinians could break. 28 years ago, I realized that Palestinian refugees, wherever they might be, whether in Dheisheh, Balatah, Shu’fat or Khan Younis, whether in Shnellar, Ein Il-Hilweh or Yarmouk, are a threat to the Zionist entity because they expose its lie of a “land without a people for a people without a land”. I understood that the Right of Return is a threat to the Zionist entity that is a usurper entity based on racism, ethnic cleansing and terror. I realized that Jrash, Deir Aban and Zakariya are names the Zionist entity wants deleted from the memory of humanity as it deleted them from the map of the world. 28 years later, I remember Sabra and Shatila and think of Palestinian babies born every day. These babies are a threat to the Zionist entity because with every Palestinian baby the Zionist myth of “there is no such thing as Palestinians” crumbles and falls, with every Palestinian baby the Zionist dream of ethnically cleansing Palestine is destroyed, with every Palestinian baby the road to Haifa, Yafa and Al-Jalil becomes shorter and with every Palestinian baby Palestine grows stronger. 28 years later, I remember Sabra and Shatila and I think of all the collaborators and the sell-outs who want to “negotiate” our legitimate rights, who want to exchange the Right of Return for more dollars and euros to fill their over-sized Swiss bank accounts and who want to sell out Palestine for more “power” in their “mini-bantustan” aka Al-Muqata’a Ash-Sharifa. To them we say: the Right of Return is inalienable and there is no peace without justice, and there is no justice without the return of all Palestinian refugees. 28 years ago, I understood that the Arab betrayal that caused our Nakba and allowed a Zionist usurper entity to be established in the heart of the Arab world and on the dead bodies of Palestinians is still a strong ally of Zionism and a partner in dictatorship, racism and denying equal rights. I understood that the Arab betrayal that allowed the Sabra and Shatila massacre to happen is still joining forces with the usurpers to devour what is left of Palestine, to ethnically cleanse and remove off the face of the earth anything with the name “Palestinian”. 28 years later, I remember Sabra and Shatila, and think of the Arab regimes who still betray Palestine through their alliance with the Zionist entity. They continue to betray Palestine every time they shake the hands of Zionist war criminals, they betray Palestine every time they allow Zionists to enter their lands, they betray Palestine every time they encourage normalization with the Zionist entity, they betray Palestine every time they refuse to boycott Zionism and its products. And the Arab peoples still betray Palestine through their silence which makes them indirect accomplices. The millions over millions of Arab people betray Palestine every time their remain in their homes while millions all over the world go out to the streets to protest Zionist terror, they betray Palestine every time they “condemn” Zionist terror on facebook and twitter while others all over the world start solidarity groups, and initiate boycott movements, they betray Palestine every time they meet with Zionists with lame excuses such as to “discuss peace” and “hear the other side” thus siding with the oppressor and equating the occupier with the occupied. The millions over millions of Arabs betray Palestine and themselves and their children every time they say “our leaders won’t allow us” while millions and millions of peoples throughout the history took their destiny in their own hands and liberated themselves from tyranny and dictatorship. 28 years ago, I saw the blood flowing in the streets of Sabra and Shatila mix with the blood of Deir Yasin, with the blood of Kufr Qasim, with the blood of Qibya, Ish-Sheikh, Ad-Dayameh, Sharafat, As-Sammou’, and countless many more. I saw men and women scattered on the ground. I saw children, like me, with no limbs and no heads. I saw horrors that were the “trademark” of Zionism. And I saw the fear, I saw the anger and I saw the resolution. I saw Palestine bleeding and I cried. 28 years later, I remember Sabra and Shatila, and think of the Palestinian blood shed by the Zionists in Oyoun Qarra, Al-Aqsa, in Al-Ibrahimi, in Jenin, in Jabalia, in Gaza. Palestine is still bleeding, cries, awaits us to stand up again as one against the occupiers and their accomplices. Palestine asks us to stay loyal to the blood of Sabra and Shatila and all the innocent victims, never to forget, and to lead the way to Safsaf, Majd Il-Krum, Amka and Yajour. 28 years I saw Palestinians become Lebanese and Lebanese become Palestinians. I saw both united against one enemy; Zionism which is the enemy of all humanity. I saw Palestinians and Lebanese neighbours living near each other, living together and living for each other. I saw Palestinians and Lebanese neighbours as it always was: Palestine hugging Lebanon and Lebanon hugging Palestine until Zionism torn them apart. I saw Palestinians and Lebanese blood mingle and become one: the blood of the innocent victims of Zionism. 28 years later, I remember Sabra and Shatila, and think of what was and what is. I think of the Palestinian refugees who lost their homes and their lands, who were forced out of Palestine and who were butchered wherever they went. I think of Palestinian refugees who have only one home to which they want to return, who have only one identity to define them: the Palestinians of Palestine. But until the day of the return; don’t they deserve to be treated like humans? 28 years ago, I saw the victims of Sabra and Shatila and understood that murderers who kill civilians know no “peace”; that killers who butcher children don’t want “peace” and that only resistance is the way to Haifa, Yafa and Akka, that only through resistance will we liberate Palestine, only through resistance will Palestine be one again; from the river to the sea. I remember Sabra and Shatila and every single massacre committed by the Zionists and their accomplices. I remember every single child, woman and man killed for the sake of Zionism. I remember every village, every town and every refugee camp that was ethnically cleansed, destroyed, bulldozed or bombed in the name of Zionism. I remember those who refused to sell their conscience, their honour and their land; I remember those who chose Palestine. I remember those who sold Palestine. 28 years ago, I, a child, sat in my bed in the middle of one September night in 1982, the images of the dead children filling my little head, the cries of the survivors echoing in my ears, tears swimming in my eyes, and swore to remain loyal to the innocent souls of Sabra and Shatila, to remain loyal to Palestine. I swore never to forget, never to forgive. 28 years later, I remember Sabra and Shatila, and I haven’t forgotten, nor have I forgiven. The war criminals still walk freely, they are welcomed in every Arab country, they are hugged and kissed by those who claim they represent us. 28 years later, I remember Sabra and Shatila and I will never forget those who, while Palestinians were being butchered by Zionists, went to have dinner with the war criminal Sharon in his ranch built on usurped Palestinian land. And 28 years ago, I cried for the victims of Sabra and Shatila and dreamt of freedom, of liberation and of the return of all refugees to their homes so they can bury their dead and dry their tears and plant olive trees where Zionism tried to kill the land. 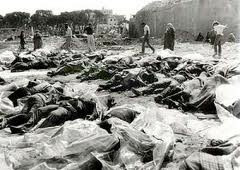 28 years later, we commemorate Sabra and Shatila; commemorate the souls of the innocent civilians butchered in a most horrific manner by the Zionist terrorists and their accomplices and watch as another set of accomplices meet with the same Zionist usurpers to sell our legitimate rights and our land. 28 years later, the tears of Sabra and Shatila haven’t dried yet. The blood of Sabra and Shatila still flows in every alley and every street of every Arab country that welcomes a Zionist war criminal. The screams of Sabra and Shatila still resound in every alley and every street of every Arab country that welcomed a Zionist war criminal. 28 years later, and 10227 days after Sabra and Shatila Palestine is still occupied by the Zionists and their accomplices. Palestinian blood is still being spilled for the sake of Zionism. Palestine is still usurped, besieged and faces daily ethnic cleansing and terror. 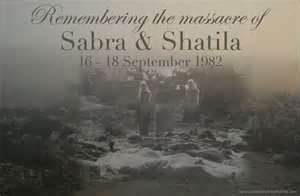 28 year later, Sabra and Shatila appeals to us, adjures us never to forget! 28 years later; our people are still steadfast in Palestine, the refugees still cling to the Right of Return and Resistance is still the only way for a free Palestine from the River to the Sea. 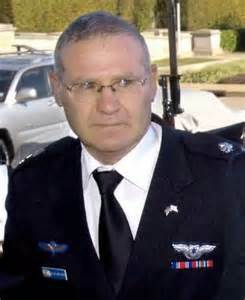 Israeli Prime Minister Ehud Barak has nominated former Major General Amos Yaron to serve as director-general of the Israeli Defense Ministry, while Barak himself retains the portfolio of Minister of Defense. According to the 1949 Fourth Geneva Convention, Yaron, whose appointment must be confirmed by the Israeli Cabinet, is a war criminal by virtue of his command responsibility for the murder of about 2000 Palestinian and Lebanese civilians during the 1982 Sabra and Shatila refugee camp massacre in Beirut, Lebanon. Should Yaron's appointment be confirmed, the U.S. government will be aiding and abetting the work of an infamous war criminal. In Fiscal Year 2000, Israel is scheduled to receive $1.92 billion dollars in U.S. military aid out of a total annual U.S. aid package to Israel worth $2.94 billion. killing at the refugee camps went on for three days. During nighttime Phalangist operations, Yaron's troops fired illumination rounds so the Phalangists could continue their bloody work. Israeli troops, under the command of Yaron, blocked the exits of the camps to prevent the refugees from escaping and supplied the Phalangists with at least one bulldozer, which was used to cover bodies with rubble. to end the killings. Israeli military intelligence later underestimated the death toll at between 700 and 800, which was criminal enough. In his testimony to the Kahan Commission, Yaron said he was "happy" about the decision to send the Phalangist forces into the refugee camps because "the fighting serves their purposes as well, so let them participate and not let the IDF do everything." Under the terms of the Fourth Geneva Convention of 1949, which was signed by both the United States and Israel, by his complicity in the massacre, Yaron allowed the willful causing of "great suffering" and "serious injury" to the residents of the camps, who were legally "protected persons" thereunder. both customary and conventional international law. Washington, D.C., decided to launch a campaign to prevent the United States government from accepting Yaron's diplomatic credentials and admitting him into the country. Together, the two of us drafted telegrams to Secretary of State George Shultz, Secretary of Defense Caspar Weinberger, and Attorney General Edwin Meese pointing out that Yaron was responsible for the commission of "grave breaches" of the Fourth Geneva Convention for the role that he played in supervising the Sabra and Shatila massacre. As such, the United States government was under an absolute obligation under the Fourth Geneva Convention to prosecute Yaron for these heinous war crimes should he set foot on United States territory. Therefore, the telegrams argued, the United States government must not allow Yaron to enter the country for any reason other than prosecution. Otherwise, the United States government would be in breach of its own obligations under the Fourth Geneva Contention. credentials. A few European states did indeed take this matter up with the United States government. In the meantime, this author sent a letter to the Legal Adviser to the Israeli Foreign Ministry stating that in the event Yaron were to set foot upon United States territory, he would personally sue Yaron in a U.S. court for his role in the Sabra and Shatila massacre. Several meetings were held between Israeli Defense Minister Yitzhak Rabin, Prime Minister Shimon Peres, and U.S. Secretary of State George Shultz over the question of Yaron's suitability to serve as Defense Attaché in light of his involvement in the Beirut massacres. The Israeli daily Davar, associated with the Labor Party, first broke the story of the meetings between U.S. and Israeli officials over Yaron in its October 22 edition, indicating that Washington and Tel Aviv had agreed that Yaron would be recalled but not immediately. Both sides later denied that a deal had been made, although a spokesperson for the Israeli Embassy in Washington, D.C., Yossi Gal, confirmed that the negotiations had indeed taken place. On October 24, 1986 the Reagan administration officially accepted Yaron's Letter of Accreditation. Attaché to Canada. To its great credit, on March 5, 1987 the Canadian government refused to accept Yaron's diplomatic credentials. Explaining the move, External Affairs Minister Joe Clark said that Canada did not consider it "appropriate" to accept Yaron's credentials. Officials of the External Affairs Ministry indicated privately that Canada had based its decision on the findings of the Kahan Commission Report. In the meantime, this author, Abdeen Jabara, Linda Huber, Esq., an attorney in Washington, D.C., Professor Linda Malone, now of the William and Mary School of Law, and Albert Mokhiber, Esq., then ADC Legal Affairs Director and later its President, convened at ADC Headquarters for the purpose of preparing a civil lawsuit against Yaron on behalf of some of the victims of the Sabra and Shatila massacre. This author and Linda Huber agreed to serve as Attorneys of Record for three Palestinian women who survived the massacre. The suit was filed in the United States District Court for the District of Columbia on May 4, 1987. The Complaint alleged that Yaron bore responsibility for the murder of the family members of the three Palestinian women under international treaties including the Nuremberg Principles, which forbid war crimes and crimes against humanity. The plaintiffs, Fatimeh Ali Aidi, Zeineb Sa'ad and Samia A. Khatib, all three of whom resided in the Shatila camp, each asked for $100,000 in punitive damages and an undetermined amount in compensatory damages against Yaron. The Complaint stated that the husband of Fatimeh Ali Aidi, the father and sister of Zeineb Sa'ad, and the mother, sister and five nieces and nephews of Samia A. Khatib, were "murdered in the Shatila Camp by agents of the defendant Yaron" and the IDF during Israel's occupation of West Beirut in September 1982. The lawsuit stated that Yaron was guilty of violating the Fourth Geneva Convention of 1949, which prohibits the killing of civilians under military occupation and incriminates an occupying power even if its "agents" carry out the killing. Citing the Nuremberg Principles, which were designed to prevent the repetition of crimes against humanity such as were committed by the Nazi occupying power in Europe during the Second World War, the suit alleged that Yaron's position of authority, and knowledge of the ongoing massacre, rendered him personally responsible for the actions of the Phalangists. Yaron was served with a summons to appear in court as he left his Chevy Chase, Maryland apartment for work on the morning of May 5, one day after the suit was filed. On May 20, 50 demonstrators picketed Yaron's apartment building, calling attention to current efforts by France, Israel and the Soviet Union to bring Nazi war criminals to justice, while Yaron continued to enjoy diplomatic status in the United States. On May 26, a motion to dismiss the case was filed by lawyers representing Yaron, claiming that he enjoyed diplomatic immunity as Israel's Military Attaché, that the statute of limitations had expired, and that the international treaties cited by the plaintiffs allowed only governments, not individuals, to bring legal action for alleged treaty violations. During the course of the Yaron litigation, the United States Department of State took the official position that Yaron possessed diplomatic immunity under the 1961 Vienna Convention on Diplomatic Relations and the U.S. Diplomatic Relations Act of 1978. Yet, at the exact same time the U.S. State Department was also involved in efforts to put former U.N. Secretary General Kurt Waldheim on the so-called "watch list" in order to bar his entry into the United States on the alleged grounds that he might have been an accomplice to the commission of war crimes during the Second World War. The U.S. Department of Justice so barred Waldheim as of April 27, 1987. By contrast, Yaron was directly responsible for the murder of about 2000 innocent Palestinian and Lebanese civilians, including women, children, and old people. Unlike Waldheim, however, not only was Yaron permitted to enter the United States, but the U.S. government also accorded him full diplomatic privileges and immunities under the Vienna Convention. The gross hypocrisy involved in these two contemporaneous decisions by the U.S. government could not have been more blatant. Nevertheless, the Federal District Judge who handled the Yaron case decided to defer to the wishes of the Department of State in this matter. The Judge observed that this was not a criminal tribunal, but only a civil action. Hence, the Judge ruled that Yaron was immune from civil proceedings in United States courts irrespective of whether or not he would be immune from criminal proceedings in some other forum. The Judge basically ignored expert Affidavits submitted to the Court independently by three American Professors of International Law, all of whom stated under oath that acknowledged war criminals such as Yaron were both criminally and civilly liable for the commission of their international crimes, whether in United States courts or elsewhere. Despite this setback, ADC continued to mount its nationwide campaign to convince Yaron that an acknowledged war criminal was not wanted by the American people to be roaming the streets of their capital, and that he should go home. Exactly one year after the Israeli government press office had quietly announced the appointment of Yaron, the Jerusalem Post of Aug. 1, 1987 reported that Yaron was to resign his diplomatic position "for reasons related to a lingering controversy" about his role in the 1982 Sabra and Shatila massacre. This "lingering controversy" was fueled by ADC's "Send Yaron Home" campaign. According to the Jerusalem Post, although the Reagan administration initially accepted Yaron's posting to Washington, it had since been actively trying to encourage Israel to recall him. Eventually Yaron returned home to Israel, where he currently lives and works with his fellow war criminals in the IDF and the Israeli government. confirmed. Also, there is no statute of limitations for war crimes. State where Yaron might travel. Legally, General Yaron is just like General Pinochet: Hostis humani generis--The enemy of all humankind!